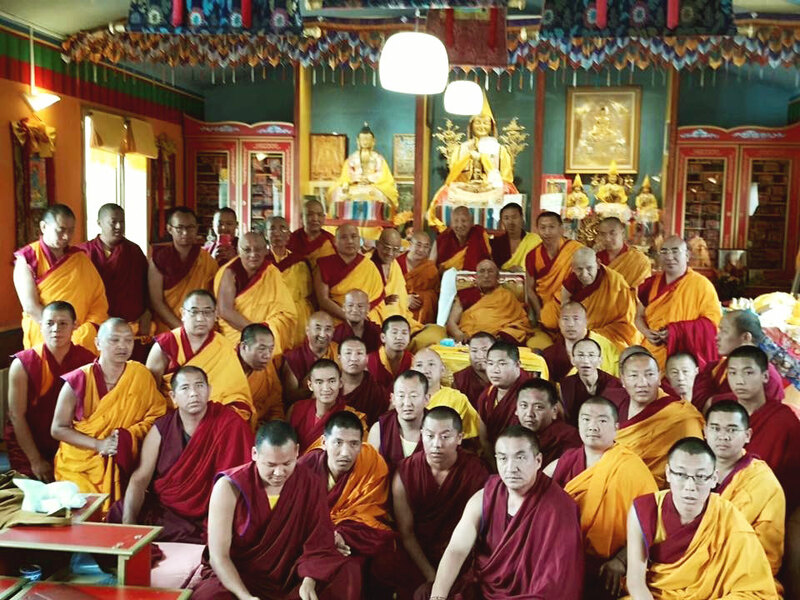 From 31st May to 2nd June 2018, His Holiness the 101st Gaden Trisur Jetsun Lungrik Namgyal Rinpoche gave a three-day teaching on the sacred Highest Anuttarayoga Tantra practice of Vajrayogini to a group of approximately 50 Sangha members and 40-50 lay practitioners at his Dharma centre in France, Thar Deu Ling. His Holiness Gaden Trisur Rinpoche transmitted the Vajrayogini teachings in June 2018. During the event, copies of a very special text containing teachings on the Tantric Buddha Vajrayogini were also distributed. 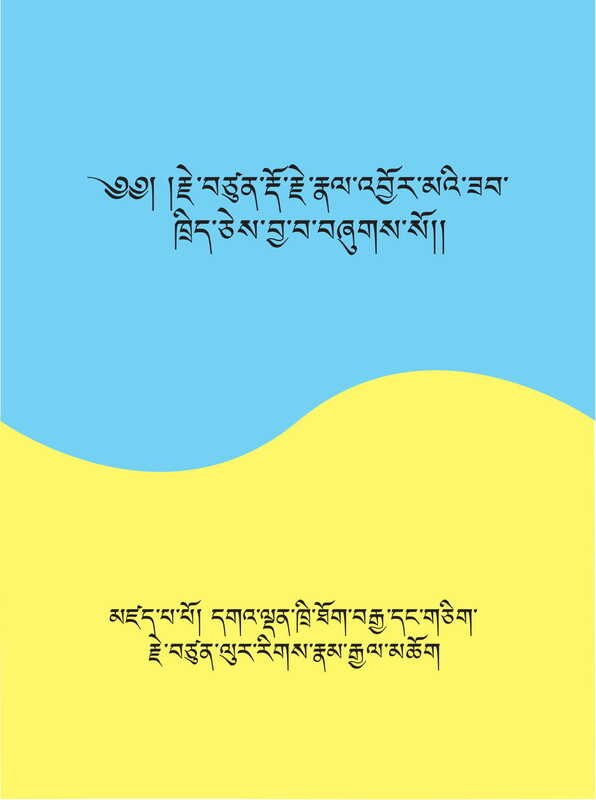 This text was composed by His Holiness Gaden Trisur Rinpoche, in accordance with teachings he personally received from His Holiness Kyabje Zong Rinpoche. 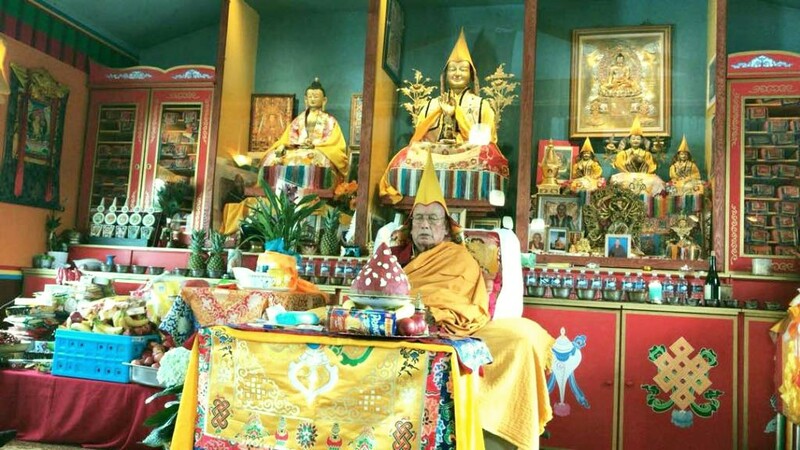 What’s incredible is that even though His Holiness Gaden Trisur Rinpoche is at the advanced age of 92, he is still turning the wheel of Dharma. 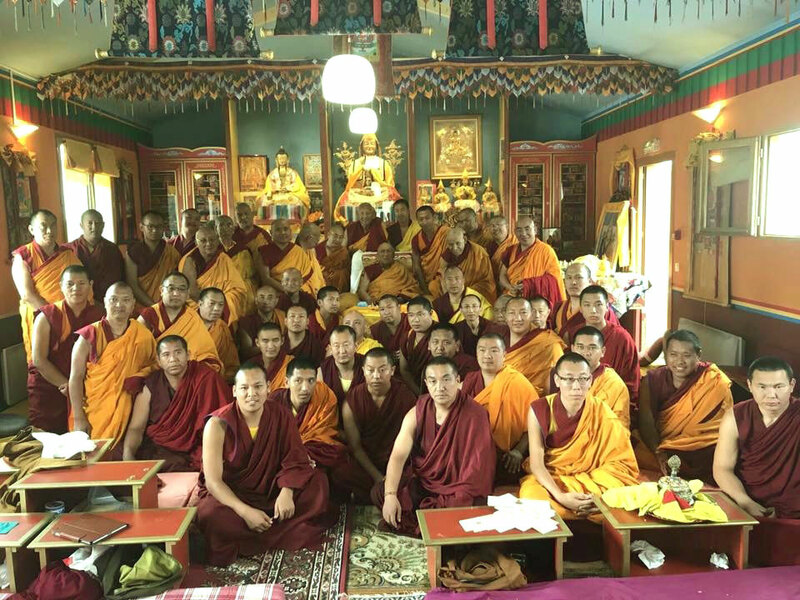 Those who had the fortune to receive the teachings from His Holiness, a pure and attained practitioner whose samaya with Kyabje Zong Rinpoche is intact, are truly very blessed. As can be seen from the photos and videos below, His Holiness was radiant throughout the three-day teaching despite having to endure difficulties and discomfort due to his advancing years. The title of Gaden Trisur is given to those eminent masters who have served office as the Gaden Tripa, or Holder of the Gaden Throne. The occupant of this position is considered to be the representative of Lama Tsongkhapa on earth. 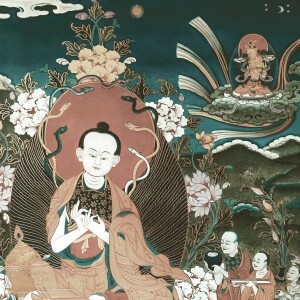 Lama Tsongkhapa is the founder of the Gelug tradition of Tibetan Buddhism who is said to reside in Gaden Heaven, also known as the Pure Land of Tushita. 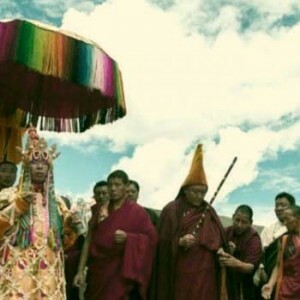 Therefore, the Gaden Tripas are the spiritual leaders of the Gelug School, the dominant Buddhist tradition of Tibet since the mid-17th century. His Holiness Gaden Trisur Rinpoche accepts a mandala offering during the event. 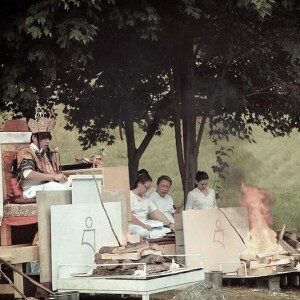 The selection of the Gaden Tripas is unique in that it is based on a hierarchical progression dependent on a monk’s learning, practice and adherence to the monastic vows and commitments, and not based on recognition as a reincarnation or hereditary birth-right. So, no monk or reincarnated lama can rise to this highest position without serious and sustained learning and practice. On the contrary, even an ordinary monk can ascend to the throne of the Gaden Tripas on the basis of his wisdom, practice, attainments and merits. 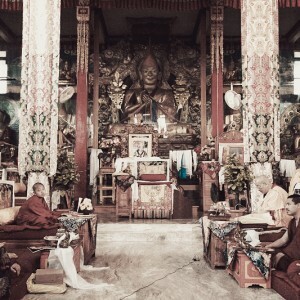 The Gaden Tripa is appointed once every seven years, alternating between the senior-most Jangtse Choeje (Lord of the North) and Sharpa Choeje (Lord of the East). 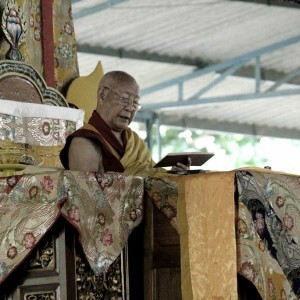 The appointment is automatic at this level but is confirmed by His Holiness the Dalai Lama, who publicly announces the appointment at the time of the changeover. Those who have completed their term as Gaden Tripa automatically receive the title Gaden Trisur or Gaden Tripa Emeritus. 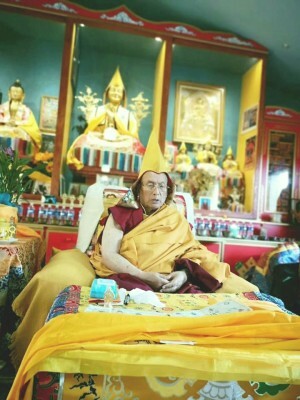 His Holiness Gaden Trisur Jetsun Lungrik Namgyal Rinpoche. 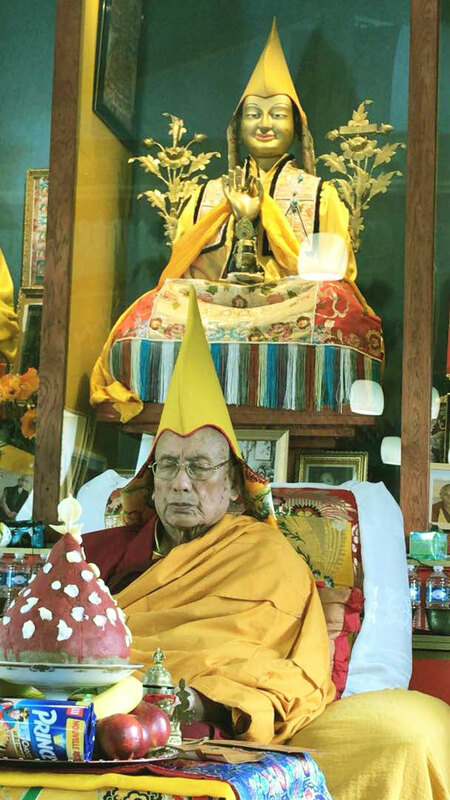 His Holiness Gaden Trisur Rinpoche was born in 1927 in Kham, eastern Tibet. 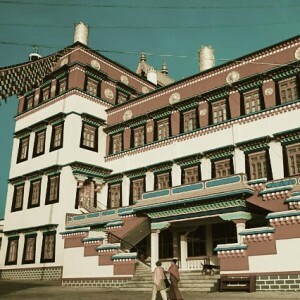 He was ordained as a novice monk at the tender age of eight in 1935 in his local monastery in Yangding, but later enrolled at Gaden Shartse Monastery, where he studied under many highly attained and learned masters. Escaping from Tibet in 1959, he arrived in Buxa, a border town between India and Bhutan. There, he completed his education. 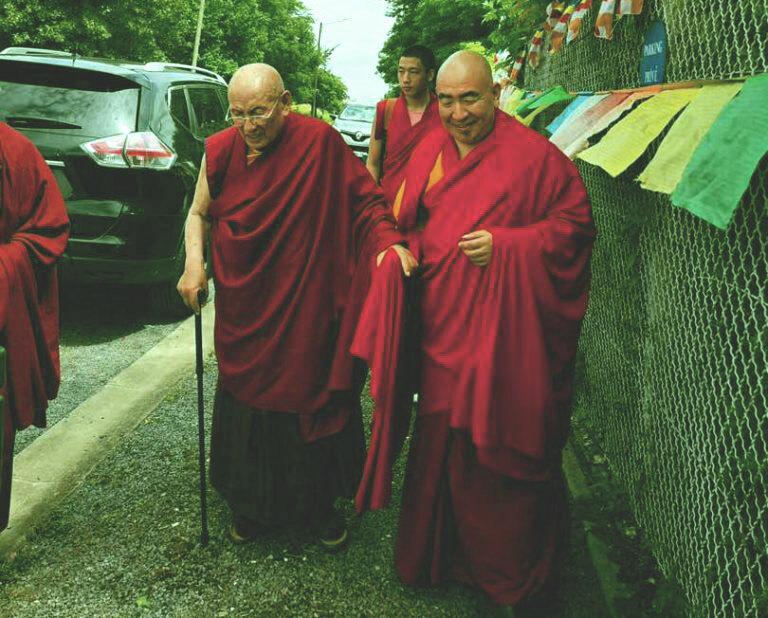 Rising through the ranks, His Holiness Gaden Trisur Rinpoche earned his Geshe Lharampa (equivalent to a Ph.D. in Buddhist studies) in 1970 and then his Geshe Ngarampa (specialist in Tantra) in 1973. 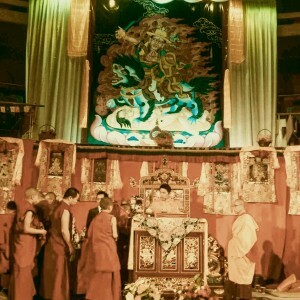 Then in 1983, His Holiness was elevated to the position of Abbot of Gyutö Tantric College by His Holiness the 14th Dalai Lama. 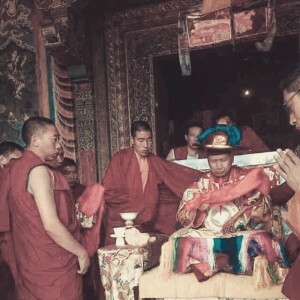 His Holiness Gaden Trisur Rinpoche became the Abbot of Gaden Shartse Monastery in 1992, and was then bestowed the honorary title of Sharpa Choeje in 1995, the second highest rank in the Gelugpa tradition alongside the Jangtse Choeje. 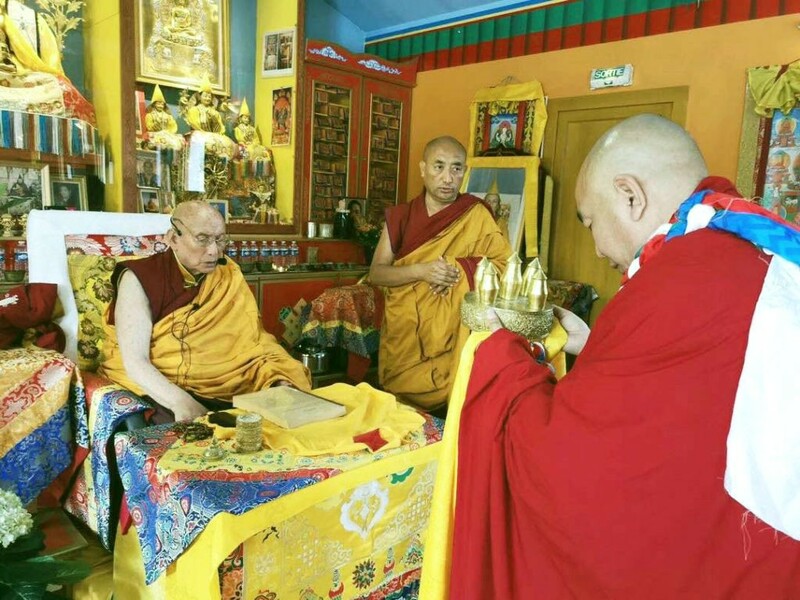 On 20th January 2003, the Dalai Lama announced the appointment of His Holiness as the 101st Gaden Tripa, during the conclusion of the Kalachakra empowerment in Bodhgaya, India. 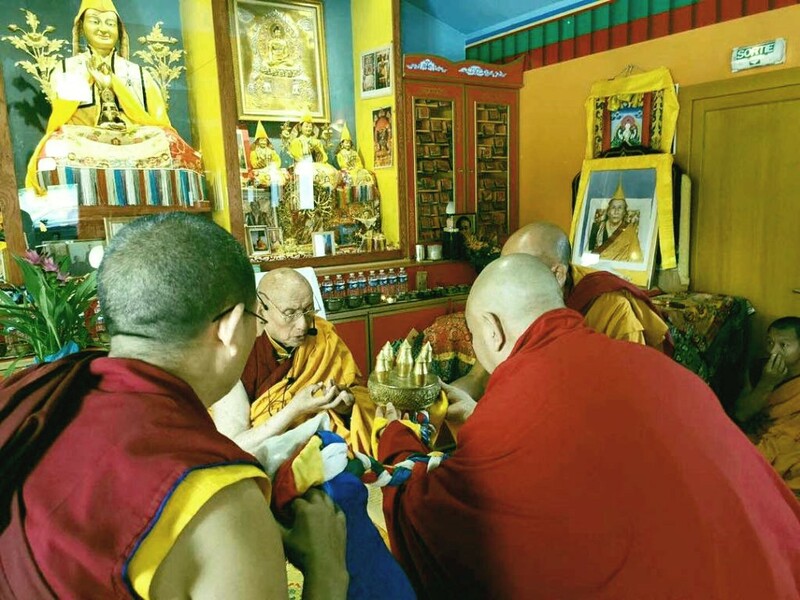 Having completed his seven-year term as the 101st Gaden Tripa, His Holiness was bestowed the title of Gaden Trisur or Gaden Tripa Emeritus. * Since then, His Holiness has resided in Paris, France. 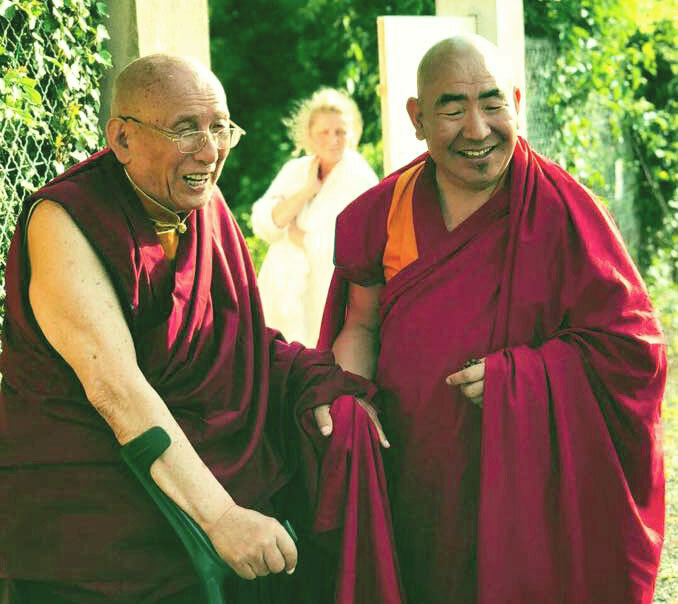 You can read more about His Holiness Gaden Trisur Rinpoche’s biography here. His Holiness Gaden Trisur Rinpoche is a great practitioner of Sutra and Tantra, and has held Dorje Shugden as his principal Dharma Protector throughout his life, even when he served as the Gaden Tripa. Having reached the age of 92 and still being able to give teachings and being in good health, all goes to show you that the power of the practices he engages in are correct. 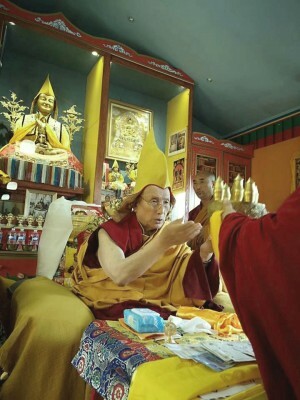 He is a strong advocate of Dorje Shugden practice and on top of that he is an inspiration to Dorje Shugden lamas who number into the hundreds, and Dorje Shugden practitioners who number into the hundreds of thousands around the world. He is a tremendous inspiration. For an accomplished master such as His Holiness Gaden Trisur Rinpoche to write a book about the Vajrayogini practice shows us the importance of this practice in this day and age. 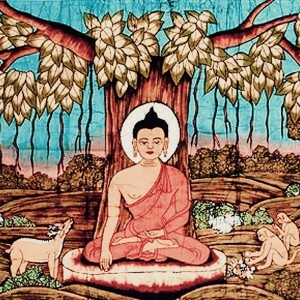 Over 2,500 years ago, the Buddha taught many types of Tantra which hasten the process of gaining Enlightenment, the ultimate goal of all Buddhists. Among these is a class of Tantra known as the Highest Yoga Tantra or Maha Anuttarayoga Tantra. 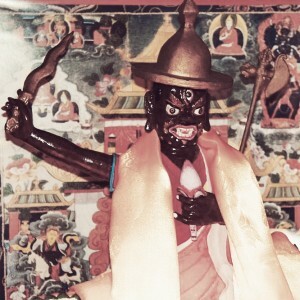 These include the likes of Vajrayogini, Heruka Chakrasamvara, Guhyasamaja, Yamantaka, Kalachakra, Chenrezig Gyalwa Gyatso, Cittamani Tara and Hevajra. These practices are said to be more efficacious and allow us to quickly gain spiritual attainments through our practice. This category of Tantra is further divided into two, the Father Tantras and the Mother Tantras. The Father and Mother Tantras are not defined by whether the Tantric deity is male or female but by the method one engages in to achieve Enlightenment. The Father Tantras focus on a method known as great bliss or the generation of the rainbow body, whereas the Mother Tantras focus on a method known as clear light. Within the class of Mother Tantras, one of the most supreme is that of Vajrayogini. 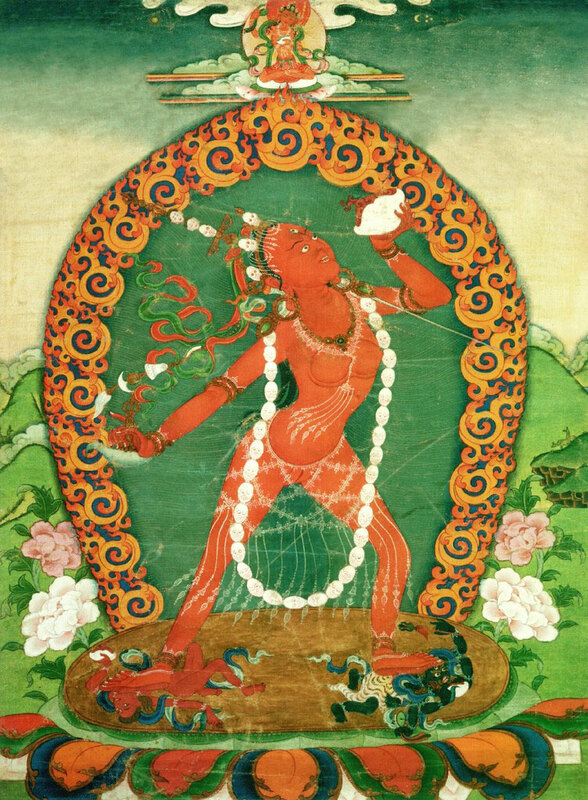 Then, merely by reciting her mantra daily without break, it is said that a sincere Vajrayogini practitioner can gain spiritual attainments, perceive her holy form, and even ascend to her pure land — Kechara Paradise. 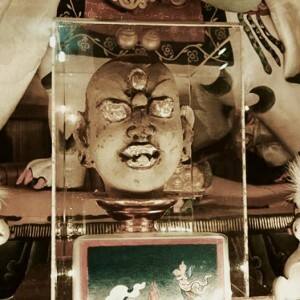 Click to download the Vajrayogini commentary composed by His Holiness the 101st Gaden Trisur Rinpoche. 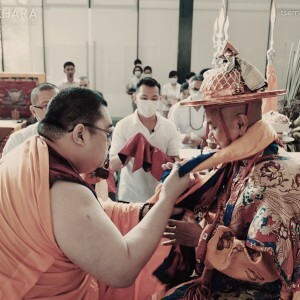 For practitioners of the lowest scope or merits, they will ascend to Kechara Paradise within 14 lifetimes, where they can receive teachings from her directly. For practitioners of the medium scope, upon their passing, they will meet her in the bardo or intermediate state between rebirths, and she will take them to Kechara Paradise. For practitioners of the highest scope, they will not leave their body behind, but be taken in their current body to Kechara Paradise itself. This is something that has been witnessed or experienced by many practitioners of the past. 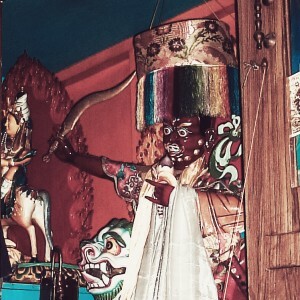 Therefore, Vajrayogini’s practice is extremely powerful and is considered a direct antidote and counter to desire, attachment and sexual energy. This sort of energy, if misdirected, can cause a lot of heartache and problems. However, Vajrayogini’s practice is a direct counter to these and many other wrong states of mind. 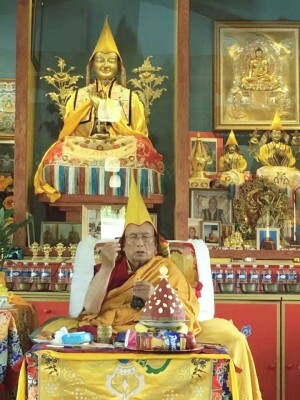 To make Vajrayogini’s practice more accessible and understandable to those with the necessary empowerments, His Holiness Gaden Trisur Rinpoche composed this commentary on Vajrayogini’s practice titled “Jetsun Dorje Naljormai Zabtri Chejawa Zhugso” based on teachings that he received directly from His Holiness Kyabje Zong Rinpoche. Kyabje Zong Rinpoche was a powerful and learned Tantric practitioner, who also served as the Abbot of Gaden Shartse Monastery in Tibet. 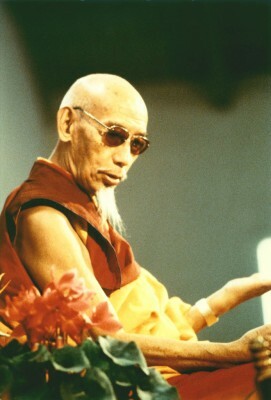 Kyabje Zong Rinpoche was known to be a realised master of the highest calibre, learning and practice and was also a disciple of His Holiness Kyabje Trijang Rinpoche, the junior tutor of His Holiness the 14th Dalai Lama. You can read more about Kyabje Zong Rinpoche here. This Vajrayogini text can be printed out, respectfully wrapped up and kept on your altar as a principal source of refuge, since it is very sacred and holy. Making offerings to this holy text on Vajrayogini will generate tremendous amounts of merits. For those without the Vajrayogini empowerment, it will create the causes to receive her sacred practice in the future, and for those who have already received her practice, it will help create the causes to attain the results of her practice. This Vajrayogini text is written in Tibetan but this does not matter because when something is holy, it has value on its own. So, I highly recommend people to download this text and keep it for the future. Perhaps in the future an English translation will be made available. It can also be placed on USB thumb-drives to be inserted into statues, or printed out to be inserted into larger statues. 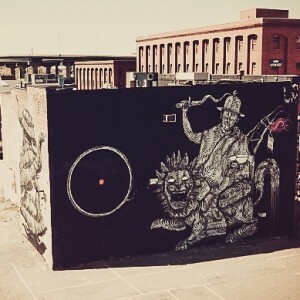 * Even though a master who has completed their term of office as a Gaden Tripa is known as Gaden Trisur, they can still be referred to as Gaden Tripa as they once held that eminent position. 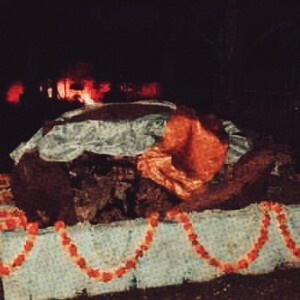 The Gaden Tripa is known as the Holder of the Gaden Throne. 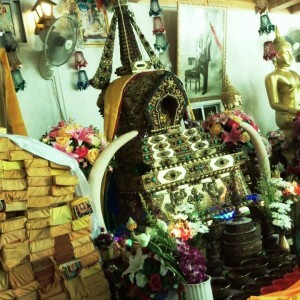 The occupant of this position is considered to be the representative of Lama Tsongkhapa on earth. 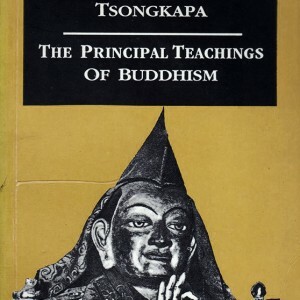 Lama Tsongkhapa is the founder of the Gelug tradition of Tibetan Buddhism. You can learn more about the Gaden Tripa by watching the video below.